The Pub With Cold Beer, in the middle of nowhere near Phong Nha in central Vietnam, is a local legend. 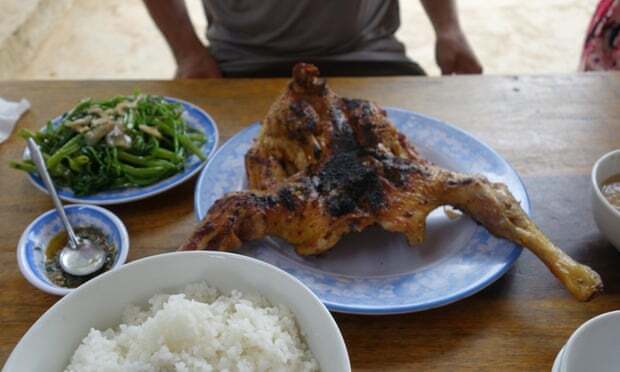 “Discovered” by Ben, the Antipodean owner of nearby Phong Nha Farmstay who has helped place it on the tourist map, it’s a family concern where you can live out your Ray Mears dream – and kill your own chicken for lunch. The “pub” grows all its own food – from the vegetables to the peanuts to the chickens running around – and the beer is, indeed, cold. Killing your lunch is optional; you can let the family do it and order by the kilo (chicken’s the only thing on the menu). But there is an argument that if you are going to eat meat, you should be prepared to kill it yourself – and this place is the antidote to the clinically sealed, slimy, supermarket chicken breasts that distance us from the realities of where meat comes from. I chose my bird from the brood of hens scratching around in the garden. With guidance from an elderly woman who had been doing it for years, I swiftly sliced its throat. It was prepared immediately, marinated in chilli, garlic and herbs; ready for the grill. After 45 minutes and another cold beer, my chicken emerged from the kitchen accompanied by a delicious peanut sauce, rice and home-grown veg. You can order roasted peanuts straight from the oven, too. Demolished in moments, it was one of the most satisfying meals I’ve ever eaten. The Pub With Cold Beer is best reached by bicycle or motorcycle – it’s signposted from Phong Nha. You can get a hand-drawn map from Phong Nha Farmstay or Pepperhouse Homestay for extra guidance but it’s just as much fun getting lost en route.